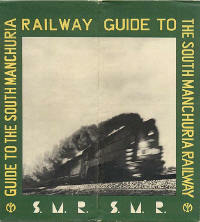 Travel brochure "Guide to South Manchuria Railway," 1934. Published by the railway. Travel brochure "South Manchuria Railway," 1933. Souvenir given out at the railway's exhibit at the 1933 Chicago World's Fair. Travel brochure "How to See Kyoto," 1932. Published by the Japan Tourist Bureau. Travel brochure "How to See Okayama," circa 1932. Published by the Japan Tourist Bureau. 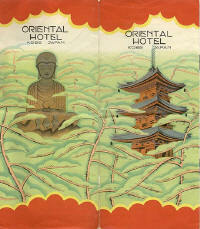 Travel brochure "Oriental Hotel - Kobe, Japan," circa 1933. Unsigned. Travel brochure "Tourist Map of Tokyo," circa 1933. Published by the Japan Tourist Bureau. Travel brochure "Guide to The Nagoya Castle," circa 1933. Published by the Nagoya Sightseeing Service Association. Travel brochure "Visit Japan across Kyushu," 1936. Published by the Japan Tourist Bureau.